Timisoara were fined €30,000 at Friday's EPCR hearing after previously being hit with a misconduct complaint. An independent disciplinary committee found that the Romanian club had not taken all appropriate measures to prepare and protect the playing surface at the Dan Paltinisanu Stadium, and that the club had breached the tournament rules. The committee determined that Timisoara's preparation of the playing surface was deficient in that pitch covers were not in place, the undersoil heating system was not ready in good time and that no suitable alternative venue for the match was available. 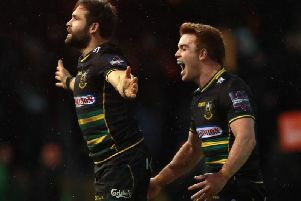 The committee also found that there were no exceptional circumstances and it decided to award five match points to Saints on the basis of a four-try bonus point result of 28-0. It was the expected outcome after the game was cancelled just 30 minutes before the scheduled kick-off time of 2.30pm last Saturday. Following heavy snowfall from Friday evening onwards, there was never a chance that the match would be played. And Saints then suffered another blow as they faced significant delays before seeing their flight from Timisoara Airport cancelled at approximately 3am on Sunday morning. It was eventually rescheduled and they were able to return to Birmingham Airport on Sunday evening at 7.30pm. And they have now pocketed another five Challenge Cup points, taking their tally to 15 points from four Pool 1 matches. Their next European game comes at Clermont Auvergne on January 12 before the pool stages are concluded with a home match against Timisoara on January 18.